A.M. Samurai (www.samurai.street.pl) was born in Warsaw in 1975. He has an engineering degree in computing and is working as a masters graduate in the school of multimedia as a technician. An interest in music was apparent from a very early age. In the early years he learned to play by ear on the Liegnitz piano. With the availability of the home computer on the market he took advantage of this and started his first electronic compositions. These were done on the Timex 2048 equipped with the AY-8910. The evolution of the home computer and constant advance in technology allowed for more capability which in turn improved compositions. The year 2000 saw the album "The Elements" recorded. This album contained tracks from many previous years however the album was never released. Another album that came into existence featured dance tracks that were especially created to suit a new dancing craze called "Energy". In 1999 in the club "Qvo Vadis" in Warsaw saw the first appearance by A.M. Samurai with a group of dancers called "Energy". A crucial advancement occurred in 2001 with the program Jeskola Buzz Digital Composer being a modular programming music studio. The applications of this program allowed the user to create a virtual studio permitting simultaneous work as well many studio functions on a home PC. Applying new technology exerted influence by bettering space and sound of tracks. New compositions gained a lot of popularity in the spacesynth genre. In 2003 A. M. Samurai joined AXIS Records (now defunct) and superseded by Alpha Centauri Records and began work on new material for his album. At the same time he also began working in co-producing videos with VM-Rexor. The fruits of this relationship gave birth to a few highly imaginative video productions, namely "Welcome To Space", "Cold Memories" and "Exploration". In addition a few music tracks were produced as well as other music material for the server sandra.org.pl and the commercial for the anti-virus program Arcavir. 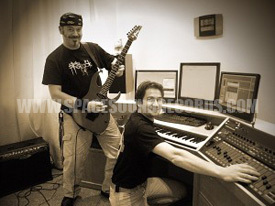 In 2005 one of A.M. Samurai's songs "Star of Happiness" was awarded 1st place in the Spacesynth Contest Traxx. The album featuring the tracks of this contest maybe found on Audioenergy Music Productions web page. In 2006, because of many different aspects the working on the spacesynth album came to a halt. However by the end of 2007 saw a return to work under the wings of the new label Space Sound Records. In the meantime there will be a few remixes available. At the moment the artist is working on finishing his spacesynth album which will be released by Space Sound Records. Hello and welcome to Spacesound Records. We would like to shed some light on the individuals who make the music we all love. What better way than hearing it from the artists themselves. My profession is Information Technology. I program computers as well as servicing them. My real passion lies in maximizing what the computer can do particularly with regards to sound as well visuals and linking them together. I also enjoy sport and travelling which inspires my creativity to the virtual world. Since Childhood I had contact with a piano. The sounds that it produced came to my liking. I don't have any formal education, but rather I am self taught. My real adventure with music began with the advent of home computers, here I could program sounds as well as creating my own compositions. As mentioned previously I enjoy travelling and getting in contact with nature. I have spent many times riding my bike through the mountain side and photographing the beautiful scenery. I don't have a particular genre that I stick to. With music I like the harmony, the climate, flow and compositional transparency. It's hard to describe as I have created other compositions. I have never given thought what they might be, I experiment and see what comes out. 7. What draws you to spacesynth and why do you like this music? Overall I love the way the electronic sound grows to a solid rythm. In principle I don't consider myself as your typical spacesynth artist, however I believe what I'm doing is OK.
With classic current spacesynth something doesn't seem right whether it's the synth sound, automatic rhythym, everything perfectly arranged like Lego blocks. This used to fascinated me but now I am returning to more natural instruments, vocals and basically giving a bit more human touch. Oh yes this question is always asked. It's hard for me to say which group or artists have influenced. I listen to all sorts of music which is constantly evolving with the passing years. There's probably many but I would have to say that Jean Michel Jarre, Michel Cretu, Christopher Von Deylen, Mike Oldfield, Jens Gada and that's just the tip of the Ice berg! 10. I guess this question follows on from the next but do you have a favorite artist and why? 11. Do you have a favorite spacesynth album and why? Recently I haven't listened to this type of music. But when I do think about it is the first two or three albums of Laser Dance that I like the most. 12. Would you be interested in working in a duet or with other artists if yes who would that be? To this point in time I've worked as a solo artist but I am open gaining more experience. If I had the opportunity to add a few new sounds to the forth-coming Enigma album I certainly wouldn't refuse. 13. Do you like Italo Disco? From this genre of music I like Roberto Zanetti. 14. A few Spacesynth artists have come from the Demo scene, were you ever part of that, if yes what was your artistic name and do you think there is any advantage to Demo artists? No, I was never part of this scene. At one stage I did create things that were similar but these always found themselves in draws. Generally my music can be associated with Demo in the sense that I do make use of trackers. Is there an advantage being such an artist, I think yes. The beauty of creating in trackers which at times is very difficult for most artists is that it allows for great editing. If you can't play anything on the keyboard you can always program it. 15. Lets move to composing. How do you start with a new track? Do you, start by trying to compose a new melody or do you play around with chords and then try and fit a melody into that or is there perhaps another way? I don't have any regulation, it all depends what ideas I have. Sometimes I start with the drum pattern, sometimes with chords. The most important aspect is realizing an idea that's in my head, once I do that everything else falls into place. 16. Recently there has been some debate about the importance of melody in spacesynth. Do you have any opinion or thoughts on this? I didn't take part in this debate, but to me the importance of the melody is paramount in most music. Without the melody the track would be boring, in principle I think we can say it is the foundation of music. 17. Spacesynth currently has many different styles for example Protonic Storm is very futuristic and pushing boundaries on the other hand Marco Rochowski epitomizes the Golden era with his classical interpretation. Where do you think you fit? I don't have any permanent place as I'm always evolving. 18. This question is a sort of follow on. Where do you think the genre is heading? Some people have said that we should move on from the LD influence and embrace influences from other genres i.e. different drums, bass and not have to rely on melody. Others have argued that the melody is the essence of spacesynth and overhauling it would kill the uniqueness of the style and thus create just another electronic sub genre. Any thoughts? With surety you can't stay in the same place and that' the way it is. If you're not evolving then sooner or later you're going to fall apart. I believe we should perfect the sounds of spacesynth; furthermore we should bring in new trends in arrangement. I do realize that my compositions on many occasions have moved away from the classic style of spacesynth, but I wouldn't describe myself as a creator of strict spacesynth. 19. Any thoughts on how we could improve the genre (musically and gaining more mass appeal)? Yes. Firstly we can' be stagnant. We have to bring in new synth sounds and take into consideration more current trends in arrangement. Secondly the composition should be transparent and spatial. The primary style of Spacesynth at the moment is rather flat and raw; it has a chance to reinvent itself. Thirdly make use of the various media, linking sound with pictures, without video clips and commercials you can't rely on having much success. 20. What sort of gear do you use? I create music by programming my virtual studio. My whole studio is a wholly configured computer to lots of VSTi plug-ins, which fulfill the role of the various studio appliances. However some of the best plug-ins can not replace the natural instrument, for this reason I have recently engaged in a guitarist as well as a vocalist. 21. At times debate has centered on Software synths vs. hardware, do you have a preference if yes why? Yes, with regards to synthesizers I make use mostly of software and the various VSTi plug-ins. They are getting cheaper, sounding much better and they don't take up room. They remember settings easily in tracks. Off-course thy do have their faults, one of the more serious being they seem to crash/suspend; this is where experience with computers comes in handy. 22. What's your favorite TV show? What's a TV show. OK seriously, I don't really watch TV thankfully as a result I have more time for music. 23. Anything you would like to say to the fans of the Spacesynth Genre ? The existence of this music is depended on demand. If you want this music to survive listen to it as there will always be someone creating something in this direction. 3. Demo or Italo? Something different. 4. TV or Sport? Definitely sport. 6. Resort or Camping? Camping. 9. Beer, wine or Spirits? Juice. 10. Blonde or Brunette? Natural. 11. Sweet or savoury? Sweet and savoury.